This Kichler Cora polished chrome 1 light bathroom wall light with ribbed opal glass shade is rated IP44 and features graceful traditional style. Boasting a circular wall mount, over-arching support arm and tapered ridged shade fitter, with downward facing opal white ribbed glass shade. The glass is not painted or coloured but etched on the inner surface to create the finish. The classic look of this collection features graceful curves and clean lines that add just the right amount of updated style to its traditional appearance. The bell shaped, clear ribbed glass with an inside etch floats beautifully on the polished chrome supports, ensuring the transitional approach complements a wide array of décors. If you are searching for a quality wall light to complement your bathroom, the Cora is certainly one to consider. The smooth, sleek lines are suitable for a contemporary setting, whilst the retro style makes it suitable for traditional and period bathrooms too. Supplied with an energy efficient LED lamp, rated IP44, fully splash proof and suitable for bathroom zones 1 and 2. There are matching two, three and four-light fittings available in the Cora bathroom lighting collection that can be viewed below. 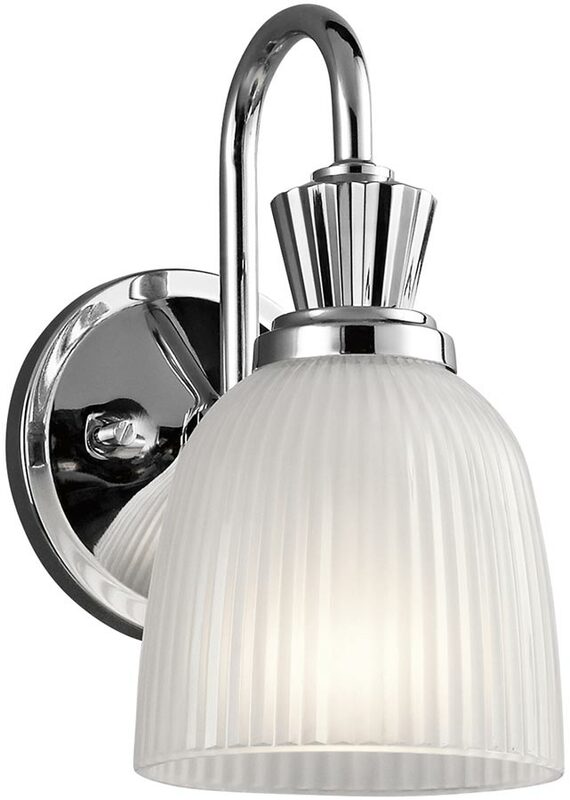 This bathroom light is supplied by Elstead Lighting and designed in the USA by Kichler who were founded in 1938. They design beautiful home lighting products featuring award-winning craftsmanship and unparalleled quality, such as the Cora polished chrome 1 light bathroom wall light with ribbed opal glass shade you see here.